Thinking your chipped dental implant is in need of some dental repair? Good idea. Even though implants are made using very strong dental materials, they are not fully resistant to damage. The two most common types of implant damage are chips and breaks. A dental implant is a tooth replacement option that closely resembles a natural tooth. When implants are chosen to replace one or more missing teeth, a dentist surgically attaches the implant into the patient's jawbone. This connection is important to the overall health of the jawbone as once someone loses a tooth, the jawbone is no longer stimulated in that area. 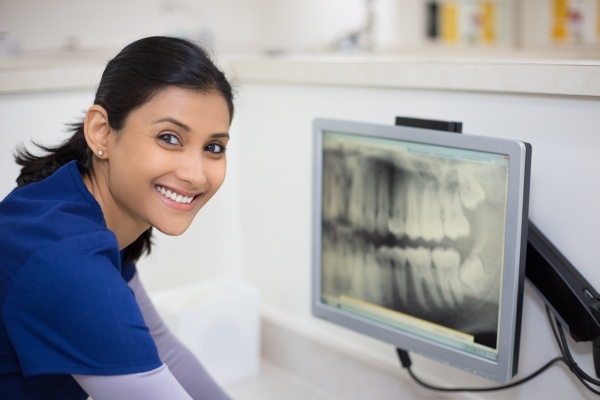 Once the artificial tooth root of the implant is connected to the jawbone, a crown is placed on top of the implant, completing the tooth replacement process. How does an implant get damaged? The fact that implants are so strong means that for an implant to become damaged, it needs to be hit with a lot of force. Some of the more common ways an implant can be damaged include: getting hit in the face with a football, falling down and hitting one’s mouth on a hard surface, chewing on extremely hard objects and participating in extreme bruxism. 1. Repair the damage – Repairing the damage to a chipped dental implant is possible and requires an experienced dentist to use a special composite material to make any and all necessary repairs. 2. Replace the implant – Depending on the extent of the damage, it may be necessary to replace the implant altogether. Which of the above 2 solutions for fixing a chipped dental implant is going to work for you? If you have already decided on a solution for the implant, great! Go ahead and give us a call so we can schedule an appointment for you. If you still are not quite sure about which of the above options is going to meet your particular needs, then give us a call to discuss your concerns. It really is important that you have all the information necessary so you can make a decision that is right for you. We hope to hear from you soon! Call (954) 281-1231 today to reach Smiles By Julia. What is a Dental Implant Same Day Procedure?